If you’re seeking out your Springtime adventure, look no further than Palm Springs. I made it the dreamy, relaxing and refreshing destination for my annual solo trip, and made a few stops I think you'll love to add to your list, too. 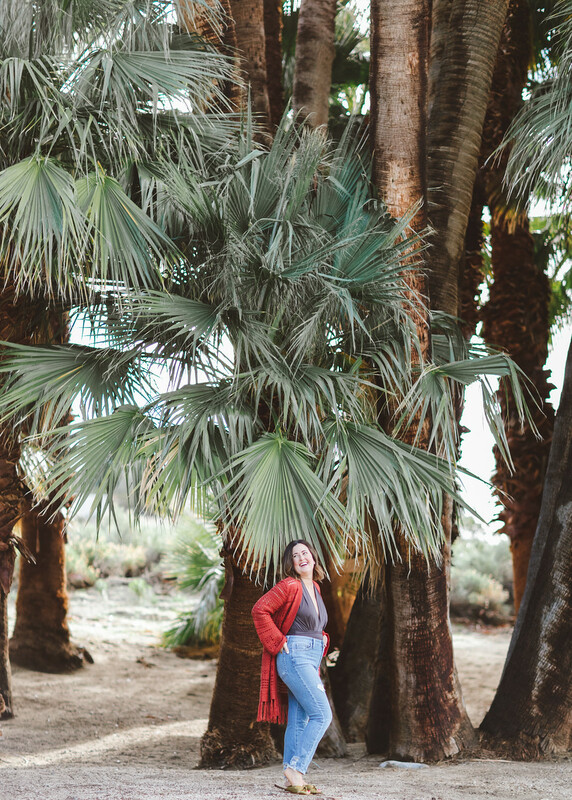 Read on for my Guide to Palm Springs! For the last few years, I started a tradition to take a week off in March for what I now call my yearly “solo retreat” - a special time designated for myself. (yep, I leave Doug at home) to relax, rejuvenate and adventure on my own. In past years, I’ve explored destinations from San Francisco, Miami, London and Tulum, Mexico (where Copal was born!). This year, I decided on Palm Springs California. My decision to visit PS was based on my current obsession for mid century architecture, consignment, thrift and vintage shopping. Mostly though, I just wanted to embrace the dry, desert heat and sunny skies. To slow down and embrace the PS lifestyle, I booked myself a room at the Two Bunch Palms, a beautiful resort known for their world famous mineral rich hot springs. Sheltered by ancient palms and giant tamarisk trees, the rooms are situated amidst 72 acres of gorgeous desert landscape. I couldn’t have been happier taking refuge in the serene surroundings during my six day stay. Two Bunch Palms has long been renowned for its healing treatments — from yoga to mud baths to Himalayan salt body treatments, to “Full-Day of Wellness” packages, I was eagerly anticipating taking full advantage of the amenities. The main attraction at Two Bunch Palms, however, are the hot springs themselves. The mineral water flows from a 600-year-old natural spring that recharges every 24 hours and returns to the ground at Two Bunch Palms. The unique composition of mineral water is world famous for its therapeutic and mood enhancing properties, and, for being rich in lithium and low in sulfur. A few hours of soaking and you’re completely relaxed and recharged. Below are a few of the restaurants and shops I hit up during my visit to PS. I hope you have the chance to experience them as well! Home: Pelago, Just Modern, and Modern Way sell new and vintage home furnishings. Villagefest: A street fair featuring arts, crafts, food and entertainment happens every Thursday night on Palm Canyon Drive. Two Bunch Palms Restaurant: Stop in for breakfast, lunch or dinner. Cheeky’s: For the ultimate breakfast (worth the wait and all the rave!). Wilma & Frida: Pick your best outfit - this place has a great scene and drinks. Farm: Cute farm to table restaurant, perfect for brunch or lunch. Shanghai Reds: Perfect for Saturday night dinner and live music. The Kipton Rowan: Rooftop pool and drinks. Need I say more? Avalon Hotel: Stop in for fancy drinks and cool California vibe. Spencer’s: An amazing upscale dinner featuring classic American fare with beautiful outdoor seating. Despite having checked off the spa, the restaurants and the shopping, I didn’t get the chance to see all that Palm Springs had to offer. I had hoped to visit the Aerial Tramway, the largest rotating aerial tramway in the world, but unfortunately it was closed due to the residual impact of excessive rain back in February. Joshua Tree Park, which overlooks the Coachella Valley, was a little too far out of the way for this trip, and SO.PA, a gorgeous outdoor restaurant with middle eastern fair (my fave!) are on the list for my next visit as well! I hope you enjoyed reading my Palm Springs roundup and get to explore some of the places I had the pleasure of experiencing! Would you like to see more from my travels adventures? Please let me know!